Green Flash Debut At WYES International Beer Tasting? For those who don't know, every year for a while now WYES (facebook - twitter), the New Orleans public broadcasting station, holds a large International Beer Tasting! This year's event is coming up soon, Saturday June 2nd, and it should be pretty fantastic. In addition to the lineup of Louisiana breweries, other good craft beers, and homebrewers, rumor has it that Green Flash Brewing (facebook - twitter) will be there as part of their arrival into the Louisiana market. I've tried many Green Flash beers that I've picked up in Texas and they will be a great addition to our local beer scene. I've also heard that they will have an Avenue Pub roll-out date, but haven't confirmed that yet. So, just in case you needed another excuse to spend an evening in New Orleans drinking beer, check out Green Flash at WYES. There is also going to be a limited space private beer tasting on Friday night, so maybe we can seen some special Green Flash beers there? I'll definitely be there to find out. For a little non-beer cross promotion, check out the new Whisk(e)y Wednesday series of posts on Jay Ducote's Bite And Booze blog. We tasted a series of scotch whiskies for our "Raise A Glass" radio show and Jay will be presenting the scores along with tasting notes weekly. As most of you know, I really do enjoy whiskey (or whisky) so it's a great chance for me to taste and rate the drinks and it's a good way for Jay to start up a new segment. 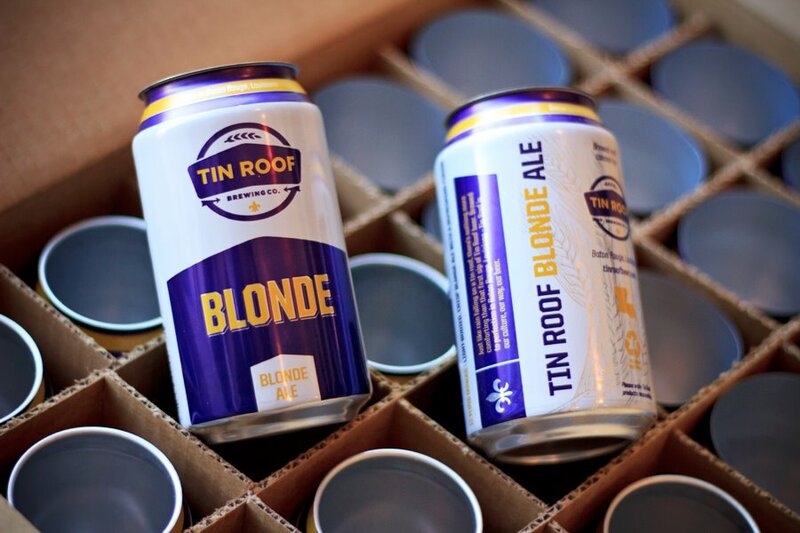 Tin Roof Blonde Ale - In Cans Now! We knew it was coming, but the Tin Roof Blonde Ale cans are finally out. They should be hitting stores today wherever you previously saw their Perfect Tin Amber cans. In my opinion the Blonde Ale is the best Tin Roof beer yet, so if you haven't tried it, grab some cans and take them canoeing, or to the beach, or out to a tailgate party before baseball season is over. What's probably even more exciting is the new seasonal coming, a Watermelon Wheat beer. It's great to see Tin Roof (facebook - twitter) branching out and trying some new beers, and it's the right time of year for a project like this. Here's hoping it proves to be as tasty as refreshing as it can be, and that this is the start of more seasonal offerings from the local guys! BATON ROUGE, LA (April 23,2012) - Tin Roof Brewing Co. is kicking off the summer with two very exciting announcements. First, the brewery is pleased to launch the very popular Tin Roof Blonde in 12oz aluminum cans. The cans will hit store shelves in the Baton Rouge area starting Tuesday, April 24 th. Other local markets, including New Orleans and the Northshore area, will begin seeing Tin Roof Blonde cans in early May. Cans are rapidly becoming a popular package for well respected craft breweries across the country. They are lighter than bottles, chill faster, and require less fuel to transport. “Cans are also the most recycled package in the world, and they protect the beer from the degrading effects of light and oxygen," McGehee added. Tin Roof is also thrilled to announce their first seasonal offering, Tin Roof Watermelon Wheat. The American wheat beer is brewed with Louisiana watermelon and is set to release in just a few short weeks. Tin Roof Watermelon Wheat will be available on draft only for several months this year. According to Tom Daigrepont, Tin Roof’s brewmaster, the recipe for the new brew has been in development for several months. 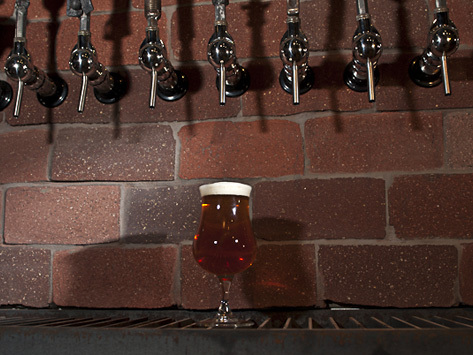 “We’ve worked really hard perfecting this beer,” said Daigrepont. “We had to experiment with several different yeast strains until we found one that melded just right with the watermelon.” The brewery credits their commitment to the use of local ingredients as their inspiration for the unique brew. 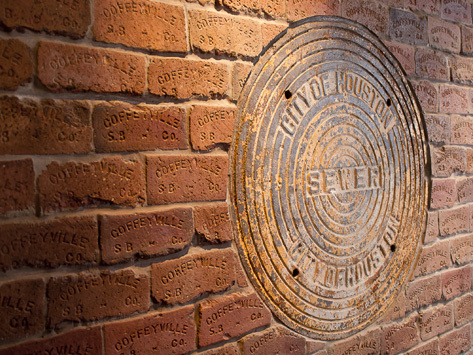 Tin Roof Brewing Company was founded in Baton Rouge, Louisiana and began operations in November 2010. 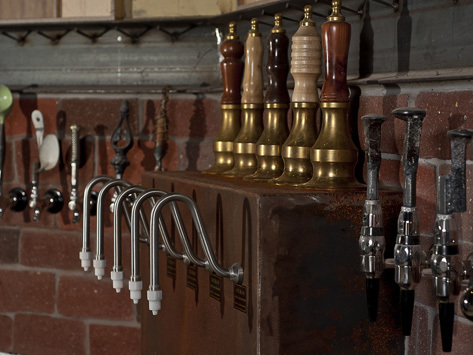 Brewery tours and tastings are held every Friday from 5:00-7:00. For more information, follow Tin Roof on Twitter, find them on Facebook, or visit www.tinroofbeer.com. Alright, a new beer bar just hours away in Houston! Houston is already home to three of my favorite regional beer bars, Petrol Station, Ginger Man Pub, and Flying Saucer, but I'm always down to try out a new place. The Hay Merchant (facebook - twitter) is located on Westheimer right by Montrose on the Southwest side of the inner loop. If you don't really know Houston that well then just know that's it's not IN downtown, but it's not far either. Mandi and I got there around 5 on a Saturday afternoon after opting to drive instead of walk thanks to impending rain. Even at 5 the few small adjacent parking lots were already full and we had to park on a side street over a block away... not a bad walk though and this is a pretty busy area so parking will probably always be on the scarce side. As we walked up I saw the patio tables already full, and there were several growlers sitting around... alright! 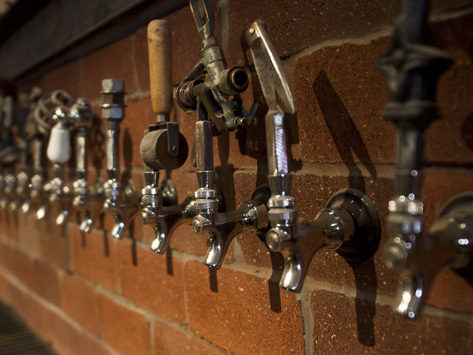 Where there are growlers, you know you have a good place for beer. We walked in, and HOLY CRAP... the place was already packed. Completely packed. With just two of us we opted to go up to the bar area, which is elevated in the read of the main space, to get some beers and wait for some stools to come available. Sure enough, after a few minutes of drinking the first round some people in the bar got up to leave, so we took their spots. We always seem to have the best luck with that... knock on wood. The food was also very good, and it's worth noting that the place is set up more like a restaurant than a bar, with a host, reserved seating in the main dining area, and a full menu. The whole time we were there people were waiting for tables, but one thing I also noticed is that just about universally, every table was filled with craft beer in addition to the food. People were there to eat AND drink, not just to grab a bite. I'm not a food critic, but I can say that the alligator boudin balls, gumbo, and butcher's burger were all delicious. All in all, another great beer bar with a side of awesome food. I will be back. Pictures all "stolen" from the Hay Merchant site... it was too dark to get good ones of my own! Hopefully they don't mind. Raise Your Pints succeeds in Mississippi! Exciting news for our neighbors to the East, the Raise Your Pints organization (facebook - twitter) was finally successful in getting a bill passed to change the archaic beer laws in Mississippi! Apparently it was signed by the governor today and will go into effect on July 1, 2012. This bill raises their legal limit from 5% alcohol by weight to 8% alcohol by weight, which is roughly 10% alcohol by volume. It also officially legalizes homebrewing in the state! This means that breweries such as Yazoo that are currently in Mississippi but not Louisiana can distribute their bigger beers, and that Lazy Magnolia can start brewing stronger beers as well. It's definitely a good thing for the state and for the beer industry to get rid of such a useless law. Hopefully the next step will be to remove the limit altogether, but hey, one step at a time, right? Well done, Raise Your Pints! Alright, three months down with my 2012 Resolution to talk one mile per drink consumed! January started off really well, with 127.55 miles walked vs. 118.5 drinks summarized here. February was pretty good as well, consistently walking more than I drank for over a 13-mile gain. March slipped a bit, my walking went down and I ended up with around an 8-drink deficit. That all left me, at the end of March, with approximately 14 miles up on my drinks. In general, I think I can do better. My average mileage for January was 4.11 and I failed to maintain that pace throughout February and March. For a large part of March I made another attempt at the slow-carb diet. While I did lose a few pounds, I actually found that I drank enough more on my cheat days to put March in a deficit, although I did drink more in January. I also hit double digit drinks 5 times in March compared to just once in January and February combined. My mileage low came on a super busy day... work, then straight to Fleming's to record an episode of Raise A Glass, then with Jay to meet one of the editors of Southern Living magazine. I didn't get a chance to walk the lakes, or take Abbey out for very long, and I didn't have any job-site walking at work. I was under 2 miles several times in March, and need to prevent that from happening in the future. Despite that, so far on the year I've lost about 7 pounds... if I can keep at that pace I'll be down 28 at the end of the year but I'd prefer to increase it. I know I can do better, and I will.